The emerging multidisciplinary field of earth system science sets out to improve our understanding functioning ecosystems, at a global level across the entire planet. Stable Isotopes and Biosphere - Atmosphere Interactions looks to one of its most powerful tools — the application of stable isotope analyses — to understanding biosphere-atmosphere exchange of the greenhouse gases, and synthesizes much of the recent progress in this work. 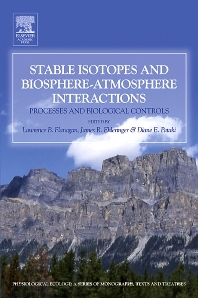 Stable Isotopes and Biosphere - Atmosphere Interactions describes recent progress in understanding the mechanisms, processes and applications of new techniques. It makes a significant contribution to the emerging, multidisciplinary study of the Earth as an interacting system. This book will be an important reference for students and researchers in biology, ecology, biogeochemistry, meteorology, and atmospheric science and will be invaluable for anyone with any interest in the future of the planet.